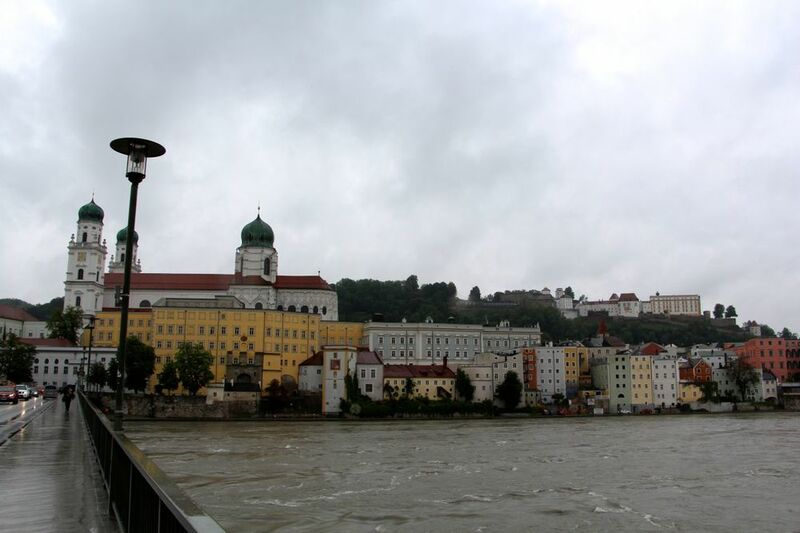 Passau is a small city sitting at the confluence of three rivers: the Inn, the Ilz, and the Danube. 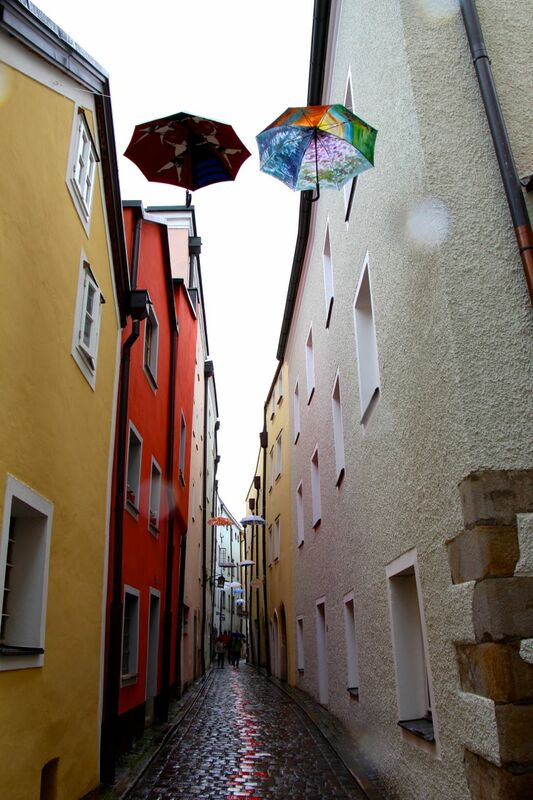 Because of this, Passau is prone to flooding, a fact that proved true during my short time in the city. It rained hard while I was there, and the riverside walkways began to be overtaken by the rising water. A wall denoting past floods (similar to the Weltenberg Abbey) is displayed on the Old City Hall. Flood waters reach the base of this wall (several meters above the river level) about every five years. I escaped the rain by ducking into the ultra-opulent Baroque St. Stephen’s Cathedral, which sits in the centre of the Old Town. It holds the largest cathedral organ in the world, and I heard its impressive sound during the daily organ concert. After hearing all 17,974 pipes blow, I enjoyed a very German lunch at the brewery/restaurant Arcobräu. Considering how well-fed I was on this trip, I massively over-ordered by getting leberkäs (a Bavarian pork pate, or ‘liver loaf’) AND cheese spätzle. This food certainly wasn’t pretty, but I can’t even express how satisfying cheesy spätzle is on a rainy day. It’s probably the only version of mac and cheese where I care more about the noodles themselves than I do about the cheese that smothers them. Those perfect, chewy noodles. 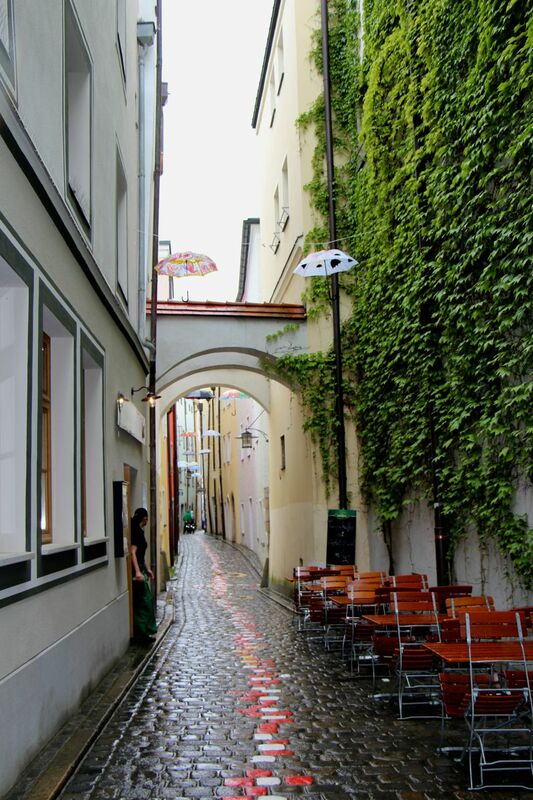 From Arcobräu, I wandered down Höllgasse street, also known as ‘Art Alley.’ Painted cobblestones lead to galleries and workshop spaces, and decorative umbrellas hung over the narrow lane (appropriate, given the city’s long term relationship with excess water). Winding my way through the narrow streets, I eventually found the Marmaladenhaus (Marmalade House! ), where dozens of European jams and jellies are sold. I also came across Café Simon, which was filled to the brim with cakes and goodies, and is especially famous for its gingerbread. I ordered a cappuccino and a kirschstrudel, because I can never get enough of cherries + pastry. After walking around all day, I was tired and a bit chilly, but all the spätzle, leberkäs, gingerbread, strudel, and marmalade meant I still had enough energy to carry me up the hundreds of overgrown steps to the Capuchin Monastery. Big wet leaves smacked me in the face as I ascended, and I eventually arrived at the top, where a spectacular view of Passau and its bordering rivers awaited. The weather meant I had the view all to myself, and I stood under the cover of my umbrella and drank it all in. What a day! What a full, excellent, rainy day! My rain gear was soaked through and my camera lens constantly water-speckled, but it was totally worth it.